Getting your thinking out on paper is a great way to focus in on your understanding of any subject. But what to do when the thinking is out on the table? When the fish is on the table…How do you give your thinking direction and what do you need to do to get others to ride along on your thinking wave? What are their ways of thinking and what are their stakes in your shared “DESIGN”?. This would be a typical Design related setting, where capable engineers sit down (or stand up) and DRAW out the challenge to get their head around the problem domain and or solution space. As the creative industry is successfully solving difficult problems in an increasingly more meaningful and sustainable way, the corporates of our world have become more interested in the creative mode an now wants a piece of this clarity serum they call ‘design-thinking’. But what would a non-designer need to help gather and forge their thinking? The NON CREATIVE PROFESSIONAL of today needs some way to handle a multitude of design variables…and they need to be able to play with the different elements. It is here where the “CANVAS” takes the stages as a valuable thinking and prototyping tool for anyone who wants to solve an intricate problem, but has no traditional training in the process of design or change. In 2009 I was lucky enough to see the rise of Alexander Osterwalders’ & Yves Pigneurs’ Business Model Canvas from up close. The simplicity of the model and its basic 9 building blocks give a business mind the opportunity to prototype any venture… by mapping out the 9 blocks and by finding the story that stands a fighting chance to survive any shark attack. Over the years I have seen this Template for designing & challenging business concepts grow into a monstrous succes. In my opinion it is the first adaptation of a template tool that can truly help you to keep on thinking one step ahead…IF YOU COMMIT TO THE LANGUAGE OF THE MODEL. Now it is 2013 and I meet up with Ruud Janssen & Roel Frissen. At the time they had some interesting building blocks that could help event organizers articulate the true value of an event. The change you create in someone when they attend an event designed by you. Their background is in corporate event design… you know… 5 days in vegas for 1500 surgeons…;). Their DESIGN perspective was raw, but they had all the right books an insane network with active leads and a good idea…so according to the Business Canvas they had something going when they set out to create a common language for great event creation. Their enthusiasm and promise to the industry still fuels their business today. It is here where my own new found purpose comes in to help these passionate and driven entrepreneurs to make the #EVENTCANVAS the succes it is supposed to be. My point of entry in this tale has been to challenge the building blocks and see how my engineering skills can help to forge a stronger and more future proof Model. As I see it at this moment (may of 2015) this EVENTCANVAS consists of 3 layers. the way stakeholders enter and exit an event. The articulation of the real Value on which all other choices in the design are based. This part of the canvas can hold up to 8 different stakeholders (to date), giving all the people involved a visible voice in the process of defining the Raison d’Etre of the event. A split between 2 ways of learning. By Experience and by Instruction. Both modes go through their processes of design to end up with the elements that honour the realisation of the promise and the valued change. Like the Business Canvas Value Proposition it is this part of the Model that still needs the most work and flying hours. 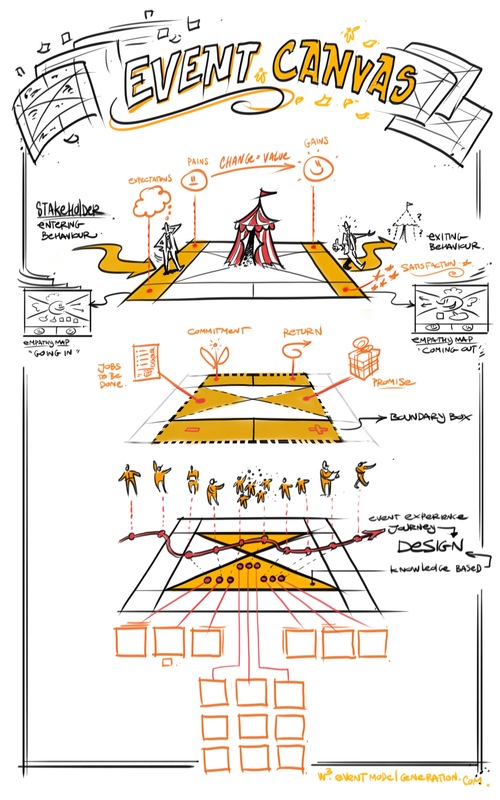 Chances are that these DESIGN parts of the EVENTCANVAS will evolve into canvasses of their own. These three parts together form an alliance. A forged event narrative that will enable its users to prototype the best shared event they can make. The event canvas will serve as a growing story that will improve over time guiding all who are involved as a compass in their thinking and decision making. If you want to learn more about the canvas or see some exiting examples of its use, check out www.eventmodelgeneration.com . 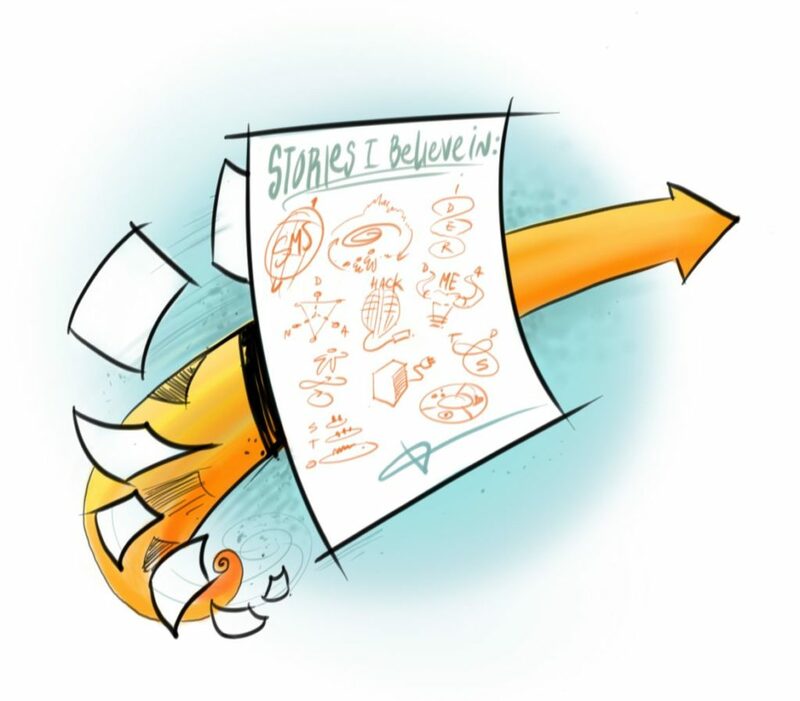 Posted in Drawing out Change, EVENTCANVAS, partners, Uncategorized. Bookmark the permalink.